Trust. That's quite a word. It seems like our whole society is having trouble trusting anyone or anything. We are continually bombarded with leaders in business, government, education and other sectors of society doing and saying things which violate our trust. These issues affect and influence us, usually negatively. Years ago, when Alan and Pauly Heller and I wrote and then released Learning How to Trust, Dr. John Trent wrote this endorsement of our book. It captures where so many people are today. “For countless people, the idea of trust is a mirage. They’ve had a parent who abused them, spouse who walked out on them, a business partner who ruined them, or a politician or pastor who betrayed their trust. Yet in order for any healthy personal or spiritual relationship to form, trust is essential, not optional. So how can you learn to trust again? May I recommend this outstanding book as a wonderful tool for learning to trust again? You’ll soon realize why trust is essential, and that there really are people and a God worth trusting. This book, and the biblical reality it infuses in the word trust, can transform your life.” Wow…that’s both real and raw for many. 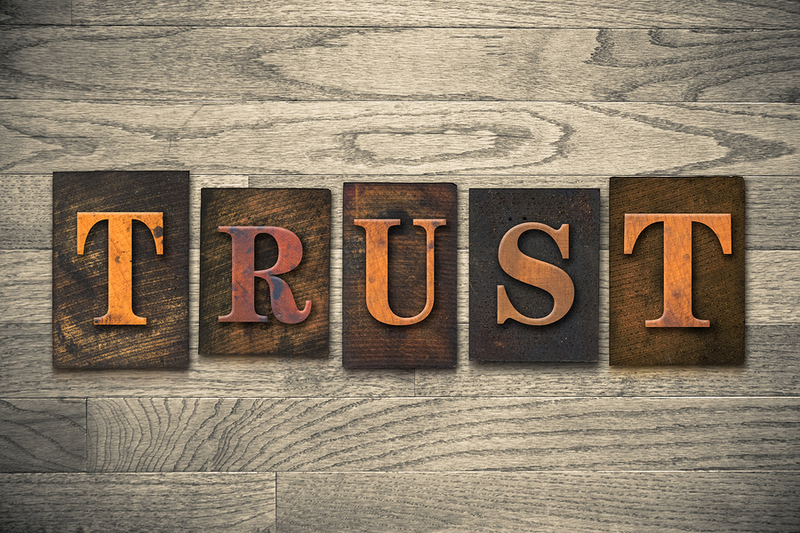 Are we losing our ability to trust? Do things have to go our way for us to trust? Is there anyone or anything that you can place your trust in these days? Are we doomed to lives of suspicion and trusting in only one person, that being ourselves? To trust or not to trust, that is the question for billions. Like the old song says, “I am a rock, I am an island...I touch no one and no one touches me." That's a tough way to live life, more existing than living. As a pastor, I have noticed that people, whether churched or unchurched, have become more jaded, cynical, and suspicious. Certainly, some of this is deserved and some not. There are trust violations everywhere. We need to use wisdom in whom and what we trust. And I'm concerned where a lifestyle of ‘trustlessness' takes us in the long run. Many live like sea urchins in the ocean that have been poked by a stick. They have retreated and are shut closed. The problem is when you shut others out, you shut yourself in. Years ago, when I was a singles' pastor, I counseled hundreds of newly-divorced people. They came into our singles' group with vows and generalizations like, "I'll never trust a man again. I'll never trust a woman again. All men are...All women are...I'll never fall in love again!" That’s not even speaking about politicians. Business, media and the like. The ‘I'll never trust again’ seems comfortable at first, but in a while can limit a person’s whole life. Perhaps we can get our trust going again, this time with wisdom and realistic expectations. The truth is you can recover your ability to trust again. You can break the trust barrier. The key is not so much the issue of trust but what we trust in, the object of our trust. I believe that human beings must trust in something or someone to be healthy and productive. We were designed to trust. To not trust is totally unnatural and severely limits the quality and potential of our lives. In other words, not to trust is more limiting than to trust wisely. Obviously, trust is such a big subject that it is impossible to present everything about trust in this article. If this article has got you to thinking, wondering and maybe even hoping that you can break the trust barrier, then consider Learning How to Trust. It is by far my highest selling book. You can order it on our website, www.nationstrategy.com. It has helped many who thought they could never trust again. And, yes, you can learn to move from trust-impaired to trust-repaired to trust-prepared.